Nowadays jobs searching in online and the interactions between recruiters & Job seekers within it is familiar to everyone so stepping up in this business is the best option for acquiring more profit. After the excessive effort, we built this script to make the resume search with no complications. Our CV Search Script is innovatively structured to responsive react dynamically for both companies and job searchers. In the markets, there is various job portal available in the markets but they were lags in simplified resume websites. Through our dedicated resume, search website industry can look at the profile and can able to filter it through various methodologies as the desire for location, education basis etc. This script is highly helpful for the startups and perfectly matches to business HR solution. Resume Search Script is a place where can get the information of the job posted by the various company based on their industrial vacancy. 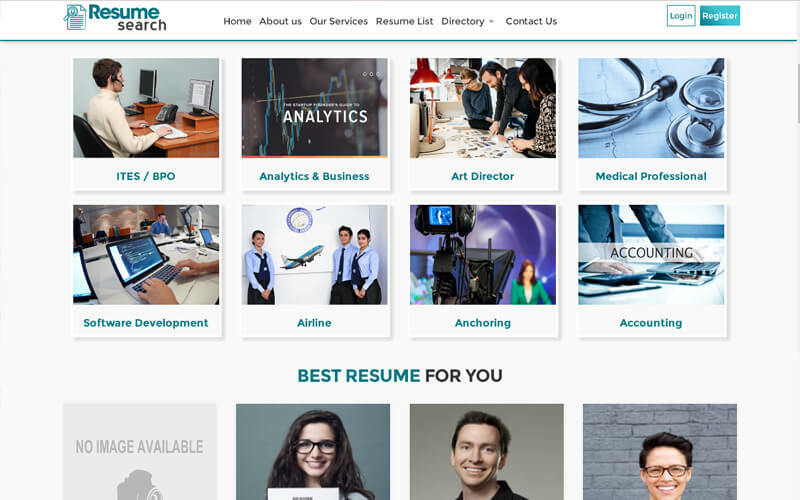 This script contains a huge number of resumes uploaded by the users so it is an efficient way to find out the right person for the place in the companies. Job Portal Script Open Source is auto self-operated to obtain the specified resume search that requires on the specified job for the recruiters so it is potent script makes the job effortless. CV Search Website Script holds the views of users, companies, and admin. Initially, users will register with basic information. They can specify detailed data like years of experience, previously worked for a company and personal details etc.., Users will get the ping if they enquired by the company. For the companies, they have to get approved by the admin with their company’s site. Job Board Software has the preference of that company can search for the resume and can download it based on the requirement of the job category, location, and other recruiters expectations. Admin has the power to control the entire board of the system like approving the registration, sending verification link, add/delete the ads and inquiry details and it is highly customizable on the need of the admin. In the footer, for a quick search most searched category, resume & location is present. Visitors can submit their feedback by filling the form if there are any queries. With the PHP Resume Script, we are integrated with social links to connect with the social media. PHP Job Board Script offers easily customized secure source code and use by anyone that no need to aware of programming skills for the maintenance. Our exciting Resume Search Script includes many of the advanced resume search features will make you feel that more profitable with all of the other revenue modules included in the script. If there are any other queries, we hitherto comfort you on round the clock. To the fact I have met the professional developers here and they made my dream resume search website into the next level of my journey. Providing php script in a reasonable prices. I have bought this readymade resume script since I am a tester i have tested many things but couldn’t find any bugs. QC highly accuracy.